My PC is not connected to the internet. How do I activate a Windows Movavi product offline (per email)? 1. You will need to have the trial version of the application installed. If you do not have it, please use the Downloads page or this page. 2. Launch Movavi product and go to the menu Help - Activate software. 3. Enter your activation key and select the Activate offline option. Then, click Activate. 4. In the next window, click Copy and transfer this information to a computer or device with an Internet connection. 5. 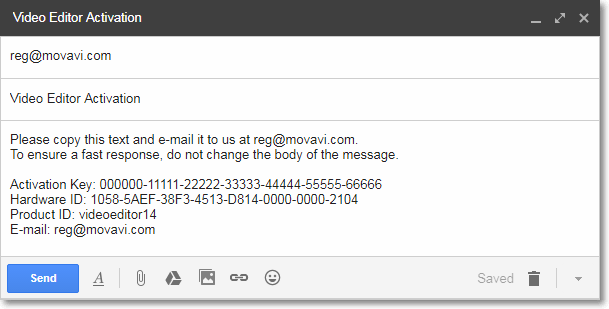 When you have access to the Internet, paste the information you copied into a new e-mail and send it to reg@movavi.com. You should receive a reply within an hour. 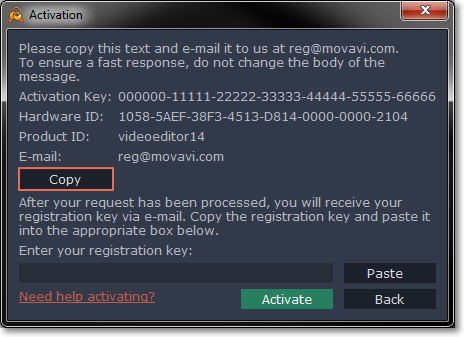 Copy the registration key from the reply and transfer it to the computer with Movavi Video Editor. Please note that the below illustrates a sample Activation key and a sample Hardware ID, use exactly what you see in your Activation window. 6. Return to the window with offline activation. If you've closed the window, repeat steps 1-3 and enter the same activation key you used before. 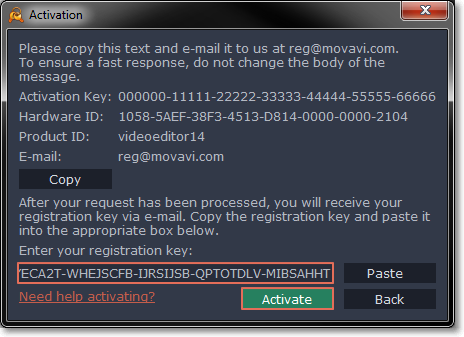 Then, paste the registration key into the box and click Activate.